Many times in the past I have been guilty of having a ‘do as I say and not as I do’ attitude and this is especially true when it comes to the subject of backing up.When I used to fix computers for a living whenever a hard drive issue was encountered I always said in my most patronising voice ‘I’m assuming that you keep a backup’ followed by a shocked look when they invariably said that they didn’t.Truth of the matter is that I have never kept a backup and so far have been so lucky in the fact that (touch wood) so far this hasn’t really caused any problems for me. I am getting older and wiser however and so the time seems right for me to start taking precautions when it comes to protecting my data so this week I have invested in a huge great big hard drive to cover the network in our office.This drive actually connects directly to the network without having to be connected directly to a computer so it is perfect for storing in a safe place on site so any of our machines can be backed up at a given time. Of course, the hardware is pretty useless without the appropriate software so after an exhaustive search I came across the free utility DriveImage XML which suited my needs perfectly.The program was so good that I thought it should be included in Click for those of you like me who have realised the error of their ways when it comes to neglecting their backup schedule. DriveImage allows you to backup an entire hard drive or partition and turn it into a single image file which can then be copied across a network, stored on a second hard drive or even split over multiple CD’s/DVD’s although the latter I really would not recommend unless the volume of the data you are backing up is extremely small.When you click on backup you are presented with a simple step by step guide which makes backing up your hard drive extremely easy and once the process is complete you’ll have created two files – one containing the description of the backup and a much larger one containing the actual data. Should you need to restore the back up DriveImage contains a utility which allows you to browse the image to extract individual files to a location of your choosing or alternatively a restore function that will guide you step by step in the process of putting every file back in to its original location. 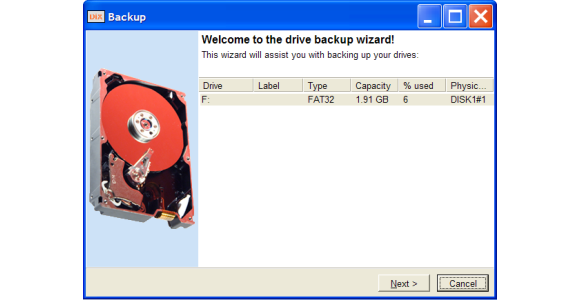 A useful tool is the Drive to Drive facility which allows you to copy one hard drive to another quickly and easily – This is particularly useful if you choose to upgrade your existing hard drive and don’t want to start installing your software again from scratch.By using this function of the program you will be able to copy your Operating System, programs and files over in one fell swoop. Whilst backing up isn’t for everybody there are businesses and individuals in the bay which would be severely hit should their hard drive crash or if their computer were destroyed or stolen – these are the people who should consider implementing a backup schedule immediately.DriveImage can be downloaded free of charge from www.runtime.org and the size of the download is a tiny 1.5mb so it is certainly worth trying out to see if it is for you.As to which media you choose to back up on I’ll leave that decision to you however I would recommend investing in an external hard drive due to the large sizes available and the fact that for security it can be kept in a different location to your actual computer.